One of the best vision boards you can make is creating a collage of your best self. It’s a simple art project that helps harness the power of your mind and heart on being your best and staying in line with your goals. Most of us have some ideas about our best self — that idealized version of ourselves when we're living our dreams, healthy, fit, fulfilling our purpose, looking great, feeling free and alive and beautiful. 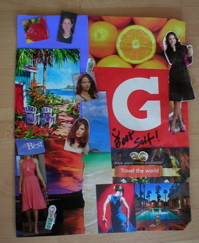 Vision boards can really help us manifest our dreams and stay committed to making our goals happen. Creating a collage of your best self collage is a specific kind of vision board with a specific purpose: to be true to your highest self and to help you morph into her more and more. Your future you is cheering you on. You can make any kind of vision board but this kind is special — its purpose is to specifically focus your vision and heart on who you want to BE, look like, feel like. The focus is entirely on YOU, not on material objects or external goals you see in your future (kids, pets, houses, money, cars, vacations, jobs, etc.). It can highlight aspects of your body, appearance, health, internal sense of identity. Anything that reminds you of your best self is fair game. For example, I have an idea for my future self's hairstyle, colors she wears, what her body looks like, etc., so I included images that are similar to inspire me. Seeing images that remind me of my personal dreams for myself helps me feel more connected to my internal compass of my future best self. "What would my best self do?" This can be a wonderful inner guidance question to ask when making a decision — from what job to take to what to eat for dinner — as she knows all your dreams. It helps me get and stay in better touch with my ideal lifestyle and to remember that I can be whomever I want to be. Mostly, this kind of vision board helps me with physical and psychological challenges, like staying away from my addictive foods, treating myself well, staying positive, and making the commitment to regular exercise, When I look at the images, I get a strong reminder of my priorities and direction, especially when it comes to my good health habits I'm trying to improve upon or maintain. Without a concrete touchstone, sometimes it is easy to drift and lose sight of how good I can be. Emotional eating and other bad habits can slip in more easily without the feeling of invisible support from my best self, especially during times of stress. Creating a collage can also help me reconnect with the active dreamer in me who knows what she wants and believes she will make those dreams come true, somehow, some way. It grounds the intention more than simply a thought. Use colors that feel like "you." Those with good energy, vitality, and that you enjoy looking at. Creating a collage (or any kind of vision board artwork) that shows your truth, how you want to feel, is a joy. Make it playful, colorful, successful, peaceful, whatever feels right. Tip: Maybe include a picture of yourself from a happy time in your life when you felt and looked great if it fits with your future self vision. Update your board whenever you like as your dreams are refined or change, and especially if it feels like it's losing its power or energy for you. It should convey energy that reminds you that you are already your best self and it's just a matter of feeling more “there” one day at a time. As with all vision boards and goals, it's not important whether or not you 100% achieve your goals. The important part is that you try, and have fun on the journey. And creating a collage of my best self to help me have concrete images to focus on that inspire me is a lot of fun! Life feels empty without something to strive for, even if it's done in a very low-key, "wouldn't that be nice one day" kind of way. Merely existing pales in comparison to seeing what you are capable of. Have fun envisioning your best self!